A few months ago my husband found a promotion online which gave you 25% off of flights to New York, so we said to ourselves, hey, let’s take advantage of this and head to NYC for a weekend! The flight itinerary allowed for either a direct flight from Toronto to New York City, or a stopover in Washington along the way. Since neither of us had been to Washington we decided to go for it, and planned to see a few tourist sites before hopping back on a plane to head to NYC the same day. 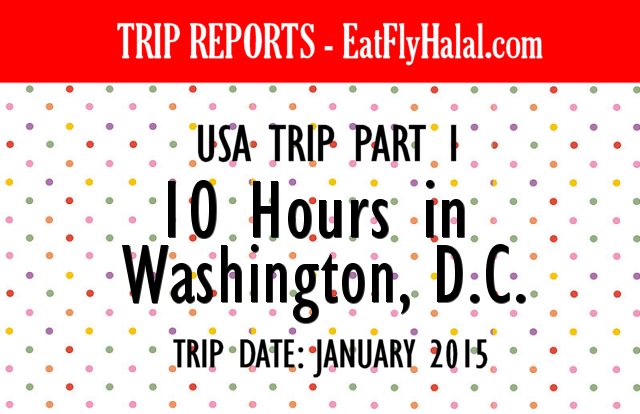 What ensued was a whirlwind tour of Washington, DC, and quite a few interesting experiences! Our flight was around 6AM, so we first went to drop off our car at a parking station near the Airport called SkyPark, which is very similar to Park n’ Fly. You park your car in their parking lot near Pearson Airport, sign a few forms and give them your keys, and they provide you a shuttle to take you and your luggage to the Airport. They have great service and their prices are pretty affordable, I definitely recommend it. Visit http://www.skypark.ca/ for more info. We arrived at the airport in the shuttle a little late, expecting that we’d be able to speed through check-in and security as quickly as a domestic flight since we were only going to New York, but were we ever wrong! The lines were suuuuuper long even at 4:30 AM, and we and at least half of the plane had to be sped through the lines to get to the security section faster. TOP TIP: Be sure to have your Hotel info printed and on hand, as you’ll have to enter it into the passport scanning machines at the US gate. Bring your hat and gloves! It's cold on the tarmac! We were on a tiny US Airways plane and the flight was pretty uneventful, it was just over an hour to Washington and there was only enough time for flight attendants to serve us a beverage, and that was it. The Washington Airport was lovely. We headed to the connected Car Rental lot connected to the airport, and used some of my husband’s travel miles and travel status to rent a car for the day (for free!). My husband will be teaching about travel hacking on his website www.CanadianMiles.com soon. Stay tuned! After parking our car nearest to the monuments, we grabbed breakfast at a corner shop and set out to see the White House. The White House is only visible from ONE SPOT in the entire tourist walking route, as it is heavily obscured by trees on all sides. The one area where the trees clear and the White House is visible is guarded by officers and playful-looking police dogs. We snapped a few pics of the WH, saw some of the tourist merchandise trucks along the street, and went back to the car for Jumah Salah. This masjid was the highlight of the trip for me. I had first seen it in Sheikh Omar Suleiman’s Inspiration Series in this episode here. It’s a beautiful stone-crafted masjid (very similar to masajid you would see in Makkah) situated in what seems like the Embassy Village of Washington (but more on that later!). The sisters section was located down some stairs accessible from the outside which is unfortunate, because it was very cold down in the hallway leading to the sisters’ prayer room and there aren't any elevators going down. The bathroom needed some work and reminded me of hajj again, with a bunch of stalls with doors… with no lights inside the stalls. But all of that were minor issues that people didn't seem too bothered about. The real highlight was the imam of the masjid, and the vibrant diversity of the Muslim community. After settling in the prayer room, I took a look around the room and at the sisters coming in, and what I found was a room full of sisters of all races and colours. Their community and apparent closeness with each other really touched me; it was so rare to see such a mix of peoples in one masjid. The khutbah (Friday Sermon) started, and a large portion of it was Arabic, and then it was translated into English. It reminded me very much of the khutbahs you hear in Makkah and Madinah, same tone of voice, same style of speaking, such a nostalgic experience. And then the salah started. As soon as the khateeb said “Aqeem as-salah” at the end, the sisters got up with such enthusiasm and made lines so quickly that I was stunned. What followed was one of the most gorgeous recitations of the Quran that I had ever heard; I was back in Makkah listening to the sound of beauty. They even had a brother equipped with a mic for the “echo”, the repetition of the takbeer at every point during the prayer just as they do in Makkah and Madinah. Gorgeous Brothers' Section - Apparently the Sisters pray here too at times. I was overwhelmed by the end of prayer. We hear on the system the imam telling us that someone has come forward wanting to embrace Islam. The sisters don’t seem surprised by this; it seems that it’s a regular occurrence. Afterwards I just wanted to talk to somebody and express my joy of discovering this lovely community in Washington DC. I met a lovely sister and told her how impressed I was with everything, she told me how beloved their Imam was to them, he is from Saudi Arabia and this masjid was like home to many of them. She then directs me to where to go for food. YES, they actually serve lunch for free to all attendees after Jumah Salah! Can this place get any better?! Oh, but it is. Could you imagine if our masajid served lunch to the whole community after every Friday prayer? Outside was an Arab bro filming a news segment for what seemed like an Arabic news agency. This was the day after King Abdullah passed away, and after Jumah Salah they had held a janazah for him, so it seems like that had something to do with it. My husband tells me that the reason why the community is so diverse here is because the Diplomats from Global Embassies in the US come to pray here. Apparently he met a few of them! On our drive to see the next tourist sites, we drove a bit around the neighbourhood where the masjid was, and every single house was an Embassy with a placard declaring which country was represented, and flags placed everywhere. It was super interesting and if it was warmer I would have loved to do a walking tour around the place. We saw the Lincoln Memorial and the National Monument, which were cool too, but not as exciting as the Islamic Center of Washington.